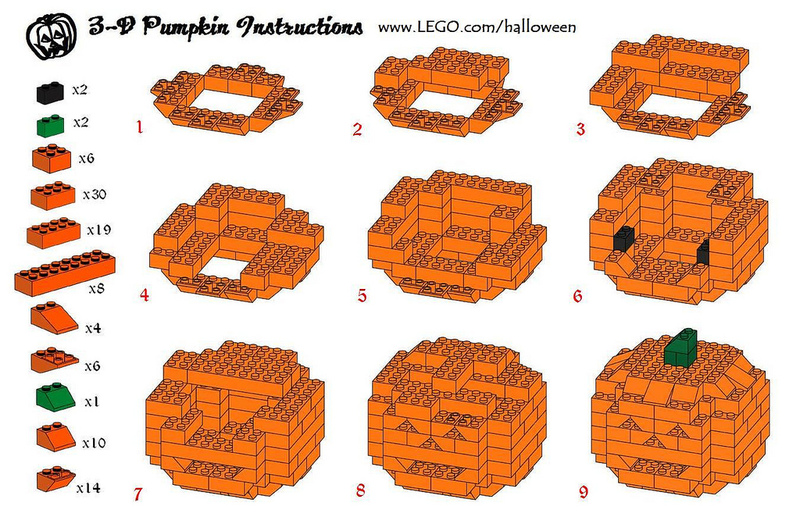 As a building tool, LEGO Bricks offer infinite possibilities to launch kids (and grown-ups) into the Halloween spirit. Which means there is no shortage of ideas available on the internet. Here, we’ve rounded up a few good ones. If you have the right mix of 97 orange bricks (which has a mix of slopes, 2x8s and 2x4s and more), we congratulate you! Of course, you can get creative and try other colors, or pick up the custom combination at the LEGO stores. Place a small light inside, and you have a perfect seasonal luminary. For a variation, check out this 3-D skull. This site features five simple spooky pieces: a ghost, a witch, a skull, a 2-D pumpkin and a bat. You could arrange these on a display, or set them next to each plate for your spooky dinner party. Or, if you were to have some kids over for a Halloween bash, these would make great homemade custom kits you could send home as candy-free party favors. Just bundle the necessary pieces in a Halloween-themed bag with the instruction card. If your child can handle something more complex, how about this pumpkin that transforms into a robot? One of the pleasures of being a LEGO enthusiast is looking at the complex displays with figures and scenes. The company has come out with some spectacular but pricey kits. We suspect the kiddos would have plenty of fun coming up with their own concepts. For the next play date, take out the bins and get the pals busy on a haunted-house building challenge. Provide some fake spider webbing and other spooky accouterments to complete the look. This is a very ambitious model, but the finished product is actually something you would want to display. Using a combination of solid black pieces with transparent whites, yellows, oranges and reds, the result is a panel that lights up if you place a light or candle behind it. With 825 parts, this would take some time and possibly an extra investment of LEGO Bricks to pull off. You can order the pattern on eBay for less than $5 from Enchanted Teacup. (A full kit is also available.) If this seems like a bit much, perhaps you and your child can come up with your own design for a seasonal mosaic, using combinations of black and transparent bricks. Fall into curiosity and creativity as your child engages in the fun and exciting model plans offered at Bricks 4 Kidz! With an engaging platform that teaches children to learn with LEGO® Bricks it’s easy to be thankful! After all, they think it’s fun, you know it’s educational!